Fiction – hardcover; Chatto & Windus; 368 pages; 2015. Review copy courtesy of the publisher. No one writes about family the way that Anne Tyler writes about family. She not only looks at what makes them tick — the complicated relationships, the prejudices, the little gripes and irritations, the humour and heartaches, the love and support, and the ways in which myths and stories develop and get passed down through the generations — she makes you genuinely care about, and identify with, the people she writes about. Her latest novel, A Spool of Blue Thread, is a classic example of her talent and skill at crafting absorbing and totally believable tales about ordinary Americans living out their relatively safe and comfortable lives. It’s her 20th novel (and said to be her last) and features her hallmark eccentricity, perceptiveness and humour. I’d also argue that it’s a fitting pinnacle to her long-established career. Set in her (usual) Baltimore, it centres on a married couple, Red and Abby Whitshank, who are approaching that time in life when they must consider whether to remain living in their much-loved family home or move into some kind of accommodation for the elderly. Both are battling health problems: Red has had a minor heart attack and is going deaf; Abby is beginning to wander off and lose her memory, perhaps a sign of dementia. Their four adult children — Denny, Amanda, Jeannie and Stem — decide that it’s no longer safe for them to live alone and they call a family meeting. ‘I could look after this house with one hand tied behind my back,’ Red said. His children half laughed, half groaned. From this pivotal point in the novel, A Spool of Blue Thread goes back through two generations to look at both sides of Red and Abby’s own upbringing to see how events and the course of their lives — and their own parents’ lives — brought them to this moment in time. Dotted throughout this narrative are the highs and lows, the funny moments, the secrets, the dreams and desires of one ordinary American family trying to navigate their way through a constant flux of change. I realise I haven’t gone into the nitty-gritty of this novel, which largely comprises set pieces (or events) in this family’s history, but to do so would ruin the enjoyment for others yet to read it. What I loved about this book was the roller-coaster like journey it took me on. From the opening chapter, in which a young adult Denny tells his father on the telephone that he’s gay, I wasn’t quite sure where it was going to take me. It twists and turns, loops back on itself, and shows how one misunderstanding after another leads the Whitshanks to their current place in time. It’s incredibly funny in places and heartbreaking in others. The characters are all vividly drawn and recognisable (every extended family, for instance, has a Denny in there somewhere, the type of person who creates endless problems and constant worry for his or her parents) and the dialogue, as ever, is pitch-perfect. I’ve read pretty much every novel Anne Tyler’s ever written — I’ve reviewed Digging to America and The Amateur Marriage here, but the others were read in my late teens and twenties long before this blog — and this one is right up there with the best. For a short while it lets you enter and inhabit an entire and perfectly described world filled with interesting and intriguing characters. If I was to fault it it would perhaps be its length — it’s slightly too long — and the change in key midway through the book. But in the grand scheme of things those are minor quibbles. As you may recall from the competition I ran in late April, A Spool of Blue Thread has been shortlisted for this year’s Bailey’s Women’s Prize for Fiction. The winner will be announced on 3 June. I’d love to see Tyler win it, if only to round off her writing career with a well-earned high. In the meantime, if you’ve read the book, please do share your thoughts below — I’d love to know what you thought of it. Were you intrigued by the Whitshanks as much as me? Congratulations to British writer Ali Smith whose novel How to be Both won this year’s Bailey’s Women’s Prize for Fiction earlier in the week. You can find out more via the official website. I’ve never read an Anne Tyler, and it sounds like that’s something I need to remedy! Is this a good place to start, or is there another one you would recommend? Any place is a good place to start, really, cos I’ve never read a dud Tyler. This one is especially good though so you could read this first. My favourites are Dinner at the Homesick Restaurant, and The Accidental Tourist. I’ve not read much of her work so I’ve no sense of how this compares but it does sound good. It’s fairly typical of her work I think. She really looks at the structure/identity of this family and explains how its mythology developed. And it’s such an absorbing read. 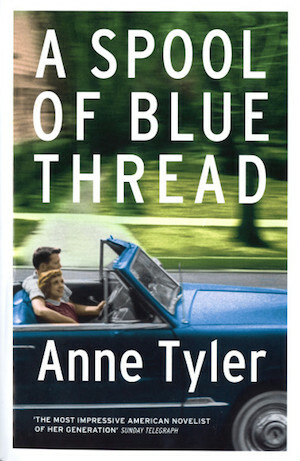 I only discovered Anne Tyler fairly recently, so I haven’t read many – Noah’s Compass, A Patchwork Planet – and now A Spool of Blue Thread (courtesy of your Bailey’s competition – thank you very much). Of the three, this is definitely my favourite. I dont think I can add much to your review – I pretty much agree with all of it – except I didn’t find it too long! I would love to see it win. Thanks Sarah. Glad you enjoyed the book (and the review). I’m keeping my fingers crossed that she wins the prize: I think she deserves it. I’ve long been an Anne Tyler fan. There has been the odd glitch – I remember being disappointed by The Amateur Marriage – but that’s easy to forgive in a career which spans twenty novels. I’m sorry that this looks like it will be her last novel but that’s just plain greediness on my part! Oh, I loved The Amateur Marriage: it was my first Tyler after a 10-year absence and it felt a bit like coming home. I, too, read most of hers in my teens and 20s, I have the one with the dead wife in it on my TBR (the title escapes me right now) and I think I might have missed one other very recent one, as I found I loved the older ones more, somehow (Noah’s Compass is the one that put me off a little). I am going to save this review and come back and comment when I’ve acquired and read this book. It might be a while, but I will return! I never got around to reading her last one either and, like you, I seem to prefer the older stuff to. I’m just so thankful I was introduced to her writing as a teenager (we studied Dinner at the Homesick Restaurant in Year 10) because it set me up for a lifetime of pleasurable reading. Throughout my teens and 20s she was my “go to” author because you were always guaranteed such a great read. For the first couple of hundred pages I absolutely loved this one – I was totally immersed in the family. What I wasn’t so keen on was the sudden lurch into the historical sections. Although they were good, I felt like some of it was telling us things we already knew or had gathered from the first section and by the time we returned to the present day at the end of the novel, the momentum that Tyler had built in the first half of the book had been lost a bit. I think I’d have preferred the stories about Junior etc to be woven more into the main narrative. Still a very good book though and a bit of a return to form after ‘The Beginner’s Goodbye’ which I wasn’t such a fan of (using building a house as a metaphor for constructing a life is overdone to the point of cliché, and she completely failed to convince me she could inhabit the character of a man in his mid-30s). Having said that, I’ve only been reading her since ‘Back When We Were Grownups’ so I’ve still got a lot of her backlist to explore. I think that’s fair comment, David. I admit to feeling a bit disorientated when the story switched back to Red and Abby’s courtship, but once I readjusted to that change in gear I realised what Tyler was trying to do: to show the drastic changes in one family’s fortunes, how they climbed the social ladder and to reveal the roots of many of the Whitshank’s stories/mythologies surrounding their identity. Admittedly, I never got around to reading The Beginner’s Goodbye — for some reason the story didn’t appeal so I never bothered to buy/borrow the book. This is such a wonderful review I feel ashamed I didn’t think as much of the book myself. Of the Baileys shortlist I’ve read this has been my favourite, but it didn’t quite inspire me in the same way as you. I would definitely like to read more Anne Tyler though. No need to feel ashamed, Alice! Reading is such a subjective thing; enjoyment depends on so many variables — the author’s skill, your past reading experiences, your mood, your preferences etc — that not everyone likes the same books to the same degree or even for the same reason. Glad you liked this one though. You’ve got an enormous back catalogue to explore now! I’d never read an Anne Tyler, but grabbed A Patchwork Planet in the charity shop for 50p as I thought it was time to see what all the fuss is about (I’ve seen others since, but it seemed silly to fill my house with more Tyler books if it turns out I dislike this one!) I’ve a feeling I’ll enjoy it though – so many of my favourite bloggers 😉 rave about her. I’ve no idea, though, if that was a good pick or not! I have to be honest and say I can’t remember a thing about A Patchwork Planet; I must have read it 20+ years ago. But for 50p you really can’t go wrong! Like you, it brought back all the reasons I loved Anne Tyler in my early twenties. It was a wonderful, wonderful book (except for the odd “attachment” at the end which I thought unnecessary, if I remember correctly; it felt like it ended twice). Yes, I kind of know what you mean about the double ending. In some ways it could almost have been two books, with the first ending with that first unexpected death. But I really did enjoy this book; it reminded me of why I love her writing so much. Thhis was my first Tyler so I couldn’t really compare it to anything, so I read Ladder of Years shortly afterwards which I really enjoyed and gave me more of a sense of her style. I can just imagine if I had come across her earlier, turning to her books for guaranteed entertainment. Yes, she’s an author I’ve returned to again and again, because I know I am pretty much guaranteed a great read. I’m envious that you have so many gems to discover for the first time in her quite ginormous backlist. Great review. I love seeing what other readers think about a book that I’ve read. We each bring with us our own “things”–perceptions about what it means to be human, what life is all about. When I read Spool of Blue Thread, I brought with me my things, and was moved immensely. Over at Goodreads, in my review, I said: “Reading A Spool of Blue Thread has been the most memorable and meaningful reading experience in my life. It ranks among my most treasured books.” I am 71 years old. One of my sons suffers from manic depression. I face death. The homes of my past mean so much to me. It felt like Tyler wrote the book for me. Thank you for such a lovely comment, Mij. I’m so pleased this book means so much to you. Anne Tyler is certainly one of those authors who knows what makes people tick — she’s a similar age to you (she’s 73), so perhaps that’s part of the reason why the book resonated so much with you? Loved this book. I thought it was a great introduction to Anne Tyler. Definitely going to read more by her. Glad you enjoyed it, Sam. You’ve got a lot of wonderful reading ahead of you if you decide to explore more of her work. Fabulous review of a fabulous book! I just finished reading it and was so pleased to find a review by someone who loved it as much as I did. Like you, I discovered Anne Tyler in my twenties and continued to read her novels for quite some time (my favorite is Dinner at the Homesick Restaurant) but for some reason I drifted away from her work. I had decided last spring to “drift” back by reading Spool; when it was included on the Booker long list I gave it priority! My family background is a bit similar to that of the Whitshanks, so I can attest (based on my own family’s stories) that Tyler is spot on in her depiction of the harshness and limitations of rural life in the 1920s and 1930s. And then, of course, her psychological understanding of what makes families tick can’t be equaled. Add to that her humor and lovely writing–well, I’ll be amazed if she wins the Booker but it was nice to see her included on the long list. Thank you for such a lovely comment, Janakay. My fave is also Dinner at the Homesick Restaurant — we studied it at school when I was about 16 and I still have very fond memories of it.